The first character we see in "The Case of the Chemical Syndicate," Batman's debut from Detective Comics #27, is Bruce Wayne, appropriately enough. Sharing the panel with him is Commissioner Gordon. Former Police Commissioner Jim Gordon has been one of Batman's staunchest allies and closest friends through the years. James W. Gordon was a Chicago cop squeezed out of his hometown for being too clean. He found his way to Gotham, a city even more mired in corruption. He began to fight the system from within at the same time Batman was trying to fight it without, taking on the bad cops and working his way up through the ranks. It was Gordon's capture of the Holiday killer that led to his promotion to commissioner, a post he held faithfully for years, remaining a fixture in Batman's life even after his retirement from the force. Gordon is an iconic part of the Bat-mythos, which is why he was brought in for an installment of Jeph Loeb and Jim Lee's best-selling "Hush" storyline. Like a lot of the folks in this year-long parade of Bat-characters, he appears just when it's most convenient for him to advance or change the story, then drops out again. So yes, it was a brief cameo, but damn if he didn't look good coming from Jim Lee's drawing table. Lee's Gordon wasn't some grand reimagining of the character, like his Huntress - this was the classic look: tenchcoat, glasses, shirt, tie and dress pants. The sculpt makes Gordon look slightly rumpled - this isn't one of the Riddler's tailored suits, but real off-the-rack clothes that a real working-class guy would wear. The paint scheme is all tones of brown, and it looks really nice: dark shoes, brown pants, tan coat, beige shirt... even his "red" tie is more of a burnt umber or brick red. The tie is actually a separate piece made from a soft rubber, so it moves more like the real thing. Pull it aside and you'll see his shirt buttons, all sculpted nicely. They even remembered to make his cuffs match the rest of his shirt. Unfortunately, the paint apps on his face aren't as good. Everything started out well, with good skintone and nice washes on his gray hair and moustache to bring out the details. There's a wash on his face, as well, but it's awful - instead of actually spreading across the sculpt and creating some pseudo-shadows, it clotted on his ears and nose, so Jim Gordon looks like a raging alcoholic on a three-day bender. Gordon has a pair of removable glasses (with brown-tinted lenses), but they barely fit his head and pop off far too easily. It's nice that DC tried, but it would have been better if they'd just had Tim Bruckner sculpt the glasses on instead of making them a loose piece - how often do you see him without his specs, anyway?Not only that, but they're flimsy - my Gordon's been open less than a day, and they've already snapped in half - too bad DCD doesn't have the customer service that McFarlane does. The Hush figures all come with a display base shaped like the current Batman logo. Five inches wide and 3" deep, the base is only about ⅜" thick, but looks nice beneath the figure. The footpeg is off to one side, but that just keeps him centered. The figure has all the typical DC Direct articulation: neck, shoulders, elbows, wrists, hips and knees. Why no waist? Who the heck knows? DC never does one. Oh well.The articulation he does have is enough to give him a few good poses, and enables him to lift and aim his pistol. Yes, based on his appearance in "Hush," Jim's packing heat. 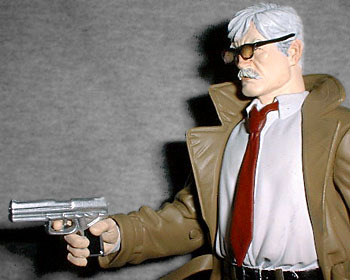 Unlike the Hush figure, whose guns were sculpted into his hands, Commissioner Gordon's gun is an actual accessory, removable and complete. 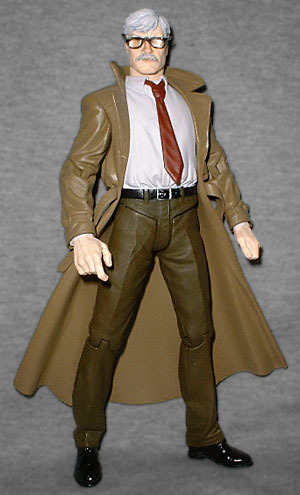 Between that and the relatively plain clothes, we'll probably be seeing a lot of Two-Face customs. This is a great figure of Comissioner Gordon, and the "Hush" line was a perfect excuse for DC Direct to make it. Think Mattel was ever going to put him in any of their assortments? Doubtful. The figure has a few big problems, but they shouldn't be enough to scare you away. Just have some glue ready for his glasses.